When a chat doesn’t end up with a sale or a signup immediately, it doesn’t mean that you missed your chance. There are still options you can explore to turn that website visitor into a customer. Some visitors need a couple of visits on your website or contacts with your customer service before making a buying decision. If you don’t want to leave that up to chance, your best bet is to get the contact information of those visitors and follow them up after a chat. Last week, I’ve discussed some lead generation strategies that won’t ruin your marketing budget. One of those strategies is generating leads through LiveChat. In this episode of Tips Under 10 Minutes, we’ll explore the lead capturing methods that LiveChat opens up. The easiest way to get leads is to get the emails from past chat transcripts in your chat Archives. This method allows you to easily capture the contact information of visitors who showed some interest in your products or services and need a bit more time to make a buying decision. Unfortunately, this method doesn’t scale too well. I can see getting 5 to 10 live chat leads at a time this way, but going over that would be too inconvineint. Since it would be difficult to get all your leads this way, this method works best for capturing only the most promising contacts. You can make your job a bit easier by tagging these contacts during chat with a specific tag like Sales or Lead. This way, you can easily find them later on in the Archives by filtering the results by that specific tag. You can capture live chat leads on a much bigger scale using one of LiveChat’s integrations with email marketing services. 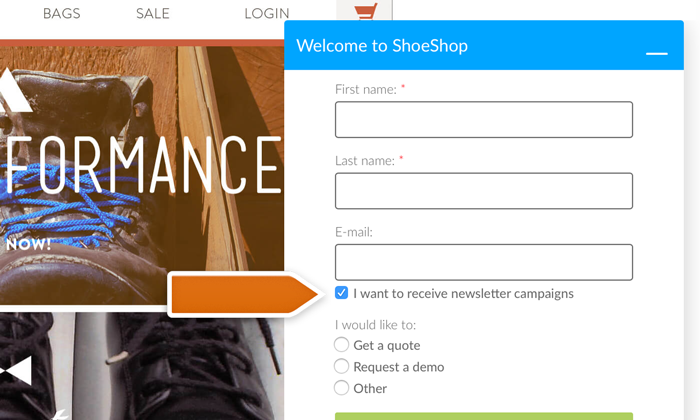 These integrations allow you to add an email opt-in checkbox to your pre-chat survey. People entering your chat would be then able to opt-in for your email marketing campaigns. Apart using these live chat leads for mass email campaigns, you can also use them for more personalized follow ups. It’s a great way to get a ton of leads as people will tend to leave the opt-in option checked. 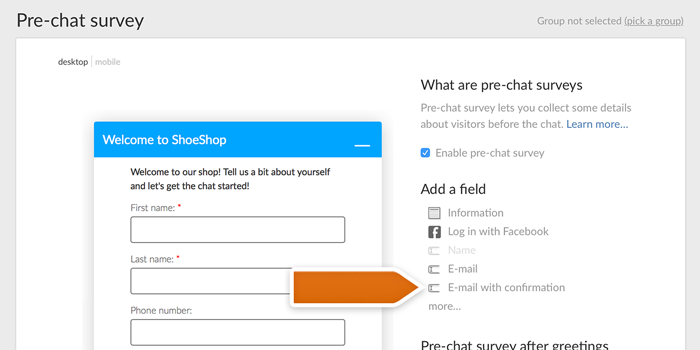 Head to one of the email marketing integration pages, turn the integration on and add the email opt-in option in the pre-chat survey settings to start gathering leads. If you’re not using any of the email marketing services I’ve mentioned, you can set up a custom integration with Google Sheets using Zapier. And what’s best about this solution – you can do it completely for free! Start off by creating a Zapier account. Zapier is a service you can use to connect other services together. You can use it to tell LiveChat to store the contact information of people who have chatted with you in a Google spreadsheet. 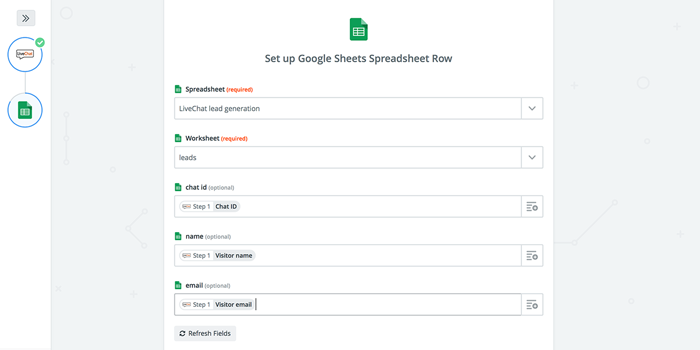 We already have a Zap that connects LiveChat with Google Spreadsheets for you. Simply access it and go through the setup process. You will need to select which LiveChat account you want to use and provide your LiveChat’s API key. Next, you need to create Google a spredsheet and set up columns for information you want to capture. They will be later on picked up by Zapier when connecting the services together. Proceed as instructed in Zapier. Next, you will need to tell Zapier which Gmail account should be used to create the spreadsheet. Finally, you need to select what information you want to pass. Getting the name and email of your visitors should be a good starting point. When you are done setting that up, click on the Save + finish button. From now on, you will receive a lead whenever a chat is completed. 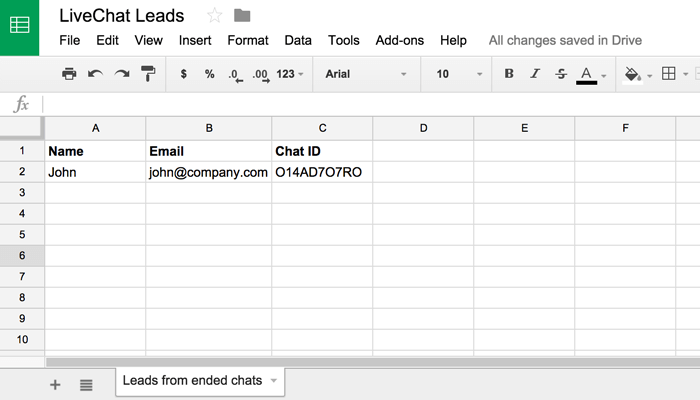 All the live chat leads will be stored in your spreadsheet. 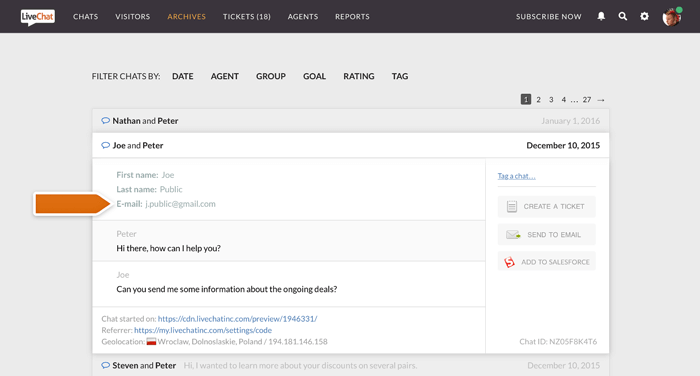 Now, if you are not planning on using a paid Zapier account, the number of live chat leads you can capture this way caps at 100. If you’d like to get more, for 20 bucks a month you can get up to 3,000 leads stored this way. If you tend to have a lot of chats with customers who show buying signals but need more time or a small push, I imagine it would be definitely worth it to spend the $20 to get the leads. 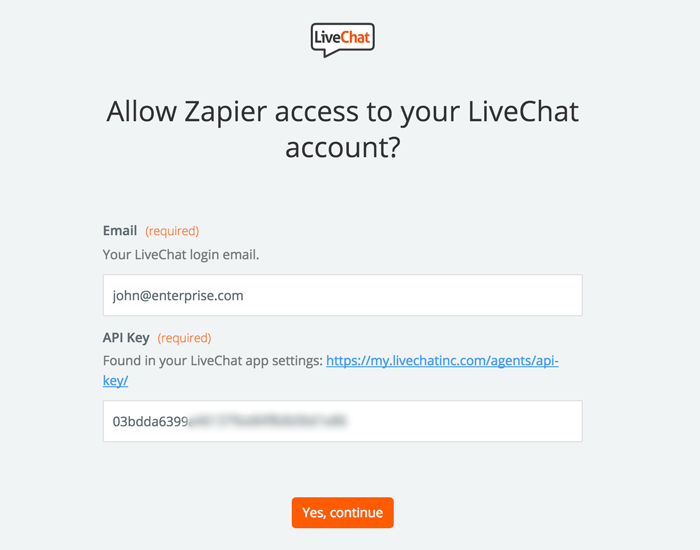 You can also try using Zapier to connect LiveChat with other 3rd party services to collect leads. Check out our Zap directory for more lead-capturing inspirations. One of the most flexible methods of capturing leads from LiveChat involves webhooks and a bit of coding. Basically, webhooks are custom notifiers that communicate with other services whenever a specified event happens in LiveChat. For example, you can create a webhook that will tell a script on your server to capture the visitor information from LiveChat whenever a chat ends. You can set up a webhook like that in LiveChat’s Webhooks section. 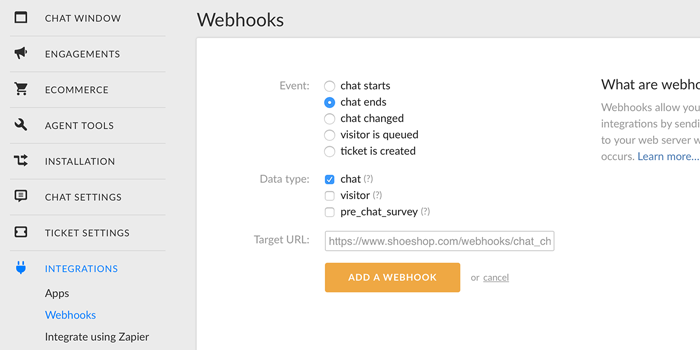 Click on the + Add a webhook button, select the time when LiveChat should pass the information (check the chat ends option) and pick what information you want to pass (check the visitor option, it includes all the visitor information). Next, you have to provide the address to the script on your server in the Target URL field that will handle the request and click on the Add a webhook button to finalize. This method allows you to store live chat leads in bulk without the use of any 3rd party services. However, you need to have a script or an endpoint to which the lead data can be sent. But this is probably not a problem for most companies with a website and an online presence. If you want to learn more about webhooks and how to create scripts for them, check out our Developers page for the webhooks documentation. Give these methods a try and let us know how many leads you managed to capture. If at any point you’d need any help, our Support Heroes will be able to help you via chat. If you’d like to utilize more of your LiveChat data like this, you should definitelly check out our Data-driven Support Management ebook. In the ebook, you can learn how to use LiveChat data to improve your cusotmer service operations.